where do i find the java documentation in the parasoft? Thanks bpowell,which version are you using because I am not able to find the Parasoft Virtualize extensibility api in 9.10 version. Can you please take a look on it. 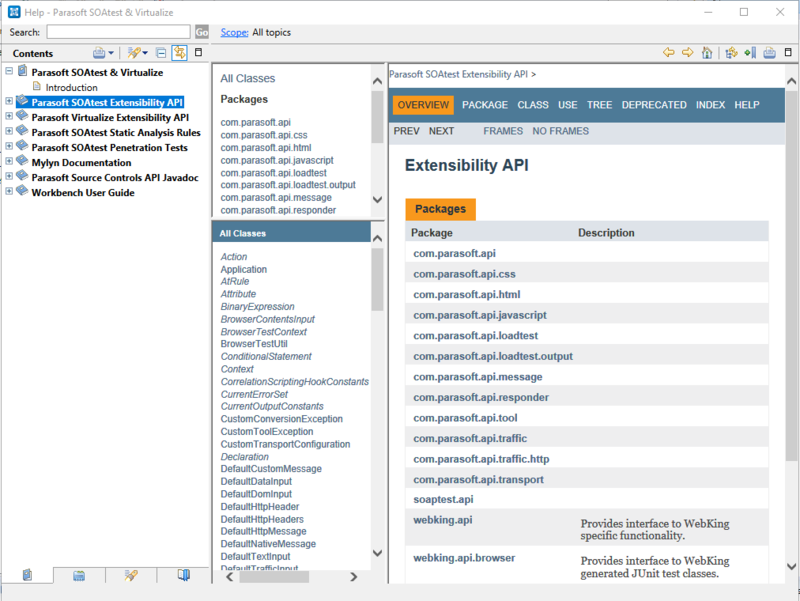 "Parasoft SOAtest Extensibility API" is the same as "Parasoft Virtualize Extensibility API". No difference. It is just the javadocs for the com.parasoft.api.jar. If you are using an early release of SOAtest+Virtualize 9.10.x then you might only see the SOAtest docs or only the Virtualize docs, depending if you lauched the tool with soatest.exe or virtualize.exe. The latest version of Parasoft Virtualize includes SOAtest (licensed separately) and is launched with soavirt.exe which loads loads common branding (look/layout/docs) for both SOAtest and Virtualize.